Some baseball players never get a real chance to shed the label of being a “quad-A” player. That is, a player with the skills to put on a show against Triple-A competition, but without enough ability to do consistent damage at the major league level. This descriptor could be applied to a number of players who have come through the Milwaukee Brewers organization in the recent past, like Jason Rogers or Matt Clark. The club recently released a player of this ilk from their minors in Kyle Wren, and called up a similar one in Nathan Orf for his first shot at The Show. Sometimes, though, a player finds and seizes the opportunity to overcome the “quad-A” stigma and establishes himself as a real MLB contributor. Or, in the case of Jesus Aguilar, he fashions himself into an All-Star. For three seasons from 2014-2016, Aguilar was an everyday player at the highest level of the minors and in each of those three seasons, he earned brief cups of coffee up in Cleveland. He mashed 68 homers and posted an .818 OPS against his competition in the International League but was generally overwhelmed by major league pitching, collecting only 10 hits (nine singles and a double) in 64 plate appearances spread across the three seasons. “Aguilar has the pop, but it’s all drawn from his natural strength; his bat looks slow and his hit tool is severely lacking,” was what BP published in their 2015 Annual, closing with “You’ve heard the Triple-A First Baseman’s Lament before: Aguilar’s bat will have to carry him, but it doesn’t look like he has enough in his skill set to turn his physical strength into baseball power.” The comments got harsher at Aguilar got older. A funny thing happened, however. After Cleveland signed Edwin Encarnacion to a three-year pact, Aguilar requested and was granted a way out of the organization that had never offered him a fair shot at the big leagues. He was placed on waivers in February just before the start of Spring Training and piqued the interest of Milwaukee’s front office. The Brewers didn’t have a clear role for Aguilar after signing Eric Thames to play first base, but according to David Stearns and company you just don’t see bats like Aguilar’s available on the waiver wire very often, so they made and were awarded a claim to his contractual rights. Aguilar didn’t play everyday in 2017, but he performed well and often enough to finally prove he was an MLB-caliber hitter. He was the team’s top pinch-hitter and platooned with Thames at first on his way to a .265/.331/.505 batting average / on-base percentage / slugging percentage slash and 16 homers in 311 plate appearances, good for a nifty little .284 True Average (TAv). That wasn’t enough to cement his roster spot for 2018, though, once the team added Christian Yelich and Lorenzo Cain with the idea of shifting Ryan Braun to first base on a part-time basis. But Aguilar didn’t let any of that get into his head, worrying only about what he could control: his production. Some roster finagling allowed Milwaukee to enter the 2018 regular season with Aguilar still in the fold, but he spent the first several weeks on the bench with his spot looking like it was in jeopardy due simply to a numbers game. The front office found every excuse they could to delay having to make a definitive decision on Aguilar’s future, and as they often do in baseball, things worked themselves out. Thames missed an extended period of time after requiring surgery for a torn ligament in his thumb suffered in late April, opening up a window for Aguilar to get a shot as the regular first baseman. The rest, as they say, is history. 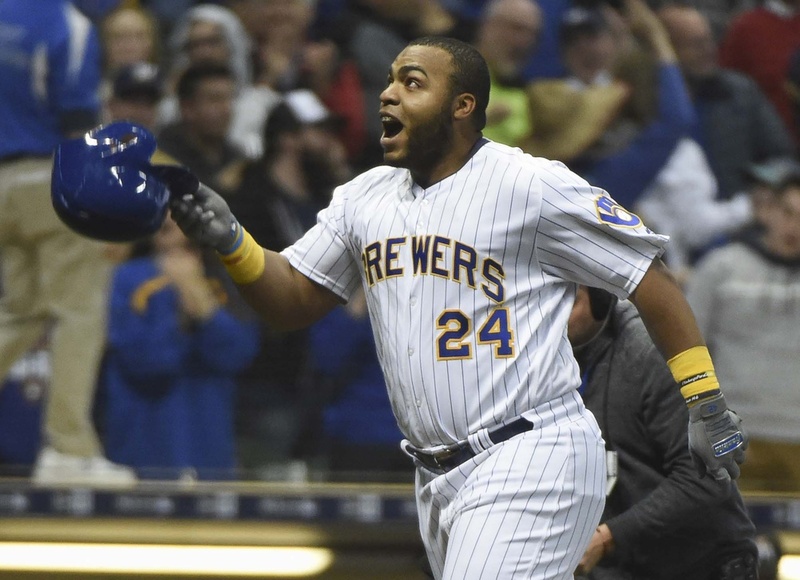 As I dove into for Brew Crew Ball a couple weeks ago, Aguilar has improved his approach against fastballs and enhanced his bat-to-ball skills within the strike zone, helping lead to an outstanding .307/.375/.644 slash through 296 plate appearances on the season. Among qualified hitters, only Mookie Betts (.374) and Mike Trout (.383) have a higher True Average than Aguilar’s .359. No National League players hit more balls over the fence than Aguilar’s 24, and his 1.019 OPS and 166 Adjusted OPS+ are both tops in the NL. Aguilar has been no slouch with the glove, either, having accrued +2.9 FRAA to help give him 3.6 WARP on the season. That makes him the 13th-most valuable position player in baseball this year and the #2 first baseman, behind only Freddy Freeman.